And the Julia Child festivities continue! As mentioned at the beginning of the week, Julia Child would have been 100 this month and celebrations are well under way throughout the blogosphere and food world. This week I thought I’d honor her in my own way, with this delightful and simple recipe as well as a Julia Child blog hop. What better way to show what an amazing influence she’s had than coming together in a sort of virtual potluck, all sharing our own takes on her now classic recipes. I picked out this buttered string bean recipe (as usual the name sounds prettier in French: Haricots Verts a la Maitre d’Hotel) from Mastering the Art of French Cooking Vol. 1 to pair with her poached salmon with cucumber sauce. Also I got these beautiful string beans at the farmer’s market! I thought it would be a nice side dish, but I have to be honest: I didn’t think it would be anything special. Julia, I’m sorry to have underestimated you. Something happens here in the way the butter and lemon juice are slowly added in turns to the blanched string beans. It creates a beautiful, flavorful sauce that’s reminiscent of chicken piccata, but also it’s own thing entirely. It’s a gorgeous side and one I’ll be making again and again. I’m currently en route from New York back to Israel so I’ll be a little behind sending out my reminder email, pinning, and responding to questions/comments. Have a great weekend! 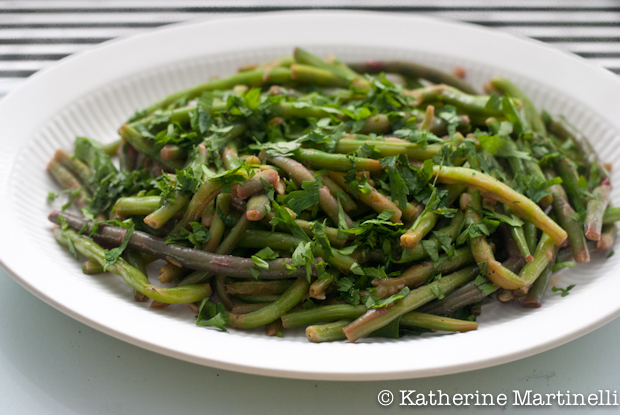 Who would think that string beans tossed with butter, lemon juice and parsley would be so delicious? This is the perfect side: flavorful, vegetarian, and fast! Blanch the string beans: Bring a large pot of water to a boil and add the string beans. Cook for 2 to 5 minutes, until just tender but still a bit crispy (Julia says: "A well cooked bean should be tender, but still retain the slightest suggestion of crunchiness."). Drain and rinse with cold water. Add the string beans to a wide saucepan and toss over high heat to evaporate the moisture. Season with salt and pepper and add ½ tablespoon butter and toss. Alternate adding the rest of the butter and the lemon juice gradually while tossing. Transfer to a serving platter and sprinkle with the parsley. Serve immediately. Happy travels and a safe return. What an interesting string beans. Haven’t seen purple ones before! Btw, I think butter base fried beans sounds absolutely beautiful. Thanks for hosting! I love the theme this week!! Great choice of theme for this week, Katherine – very timely. 🙂 Those beans sound delicious – funny how the simplest ingredients can sometimes make the tastiest dishes! Those colored beans are really beautiful. Love this simple, classic dish! Can’t the best cooking be so very simple? How simple yet delicious! I love the colored beans too. Although I make a similar dish frequently, I haven’t added lemon for quite some time. You’re right, the lemon becomes magic in this dish. Thanks for reminding me how good it can be! Oh my goodness … I adore simple recipes made with whole ingredients … and this completely fits the bill! And so many great Julia Child recipes in one place! Another great blog hop, Katherine! Love this blog hop, Katherine! Safe travels back to Israel. Delicious composition with this colored beans . Such a delicious pictures. I love Julia and all her butter drenched glory! This is a lovely recipe. Those purple string beans are so gorgeous that I almost don’t want to to be cooked. But those butter beans look so tasty that it kind of makes up for it. 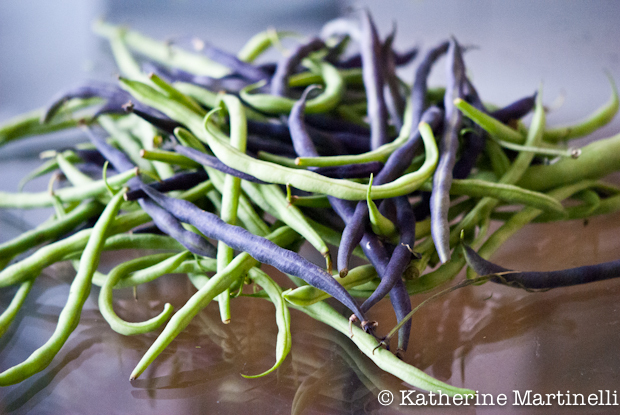 I love the purple green beans – I’ve never tried it before. Simple and delicious recipe! Easy recipe, and i lobe this pyrple beans, greeting from belgium. Great side dish for any meal. I love Julia and her simple yet flavorful recipes. I am loving your pics here..
Just letting you know of there are a few spelling mistakes in French. It should be; Haricots vert à la maître d’hôtel and not Hericots Verts a la Maitre d’Hotel. Also the French grammar, those not permit any capital unless to begin a sentence or a main name. This weeks line up from the #SundaySupper club is absolutely stunning! Please join us in making your favorite Julia Child dish and visit ENOFLY wine blog where Martin Redmond is meticulously pairing these scrumptious dishes.